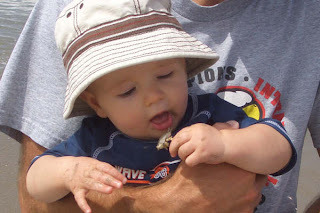 While we were at the beach Greg showed Maddux a sand crab and he picked it right up and tried to eat it!! GROSS!!! Everyone thought it was so funny...except me! Can you belive he wanted to eat that? 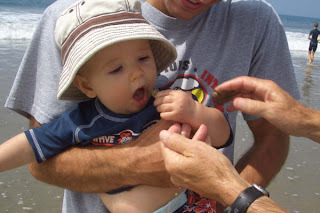 Good thing Grandpa is right there...he's pretty close to making it in his mouth! Nate on the other hand wanted nothing to do with them...smart little guy! Over Labor Day we were able to make a quick trip to California to see Greg's family and some of his friends who were visiting from England! 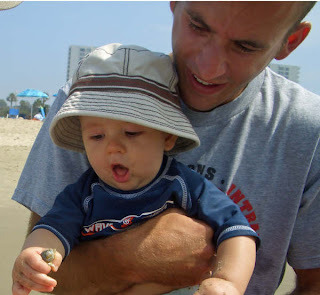 The best part of the trip was taking Maddux to the beach for the first time! He LOVED it! 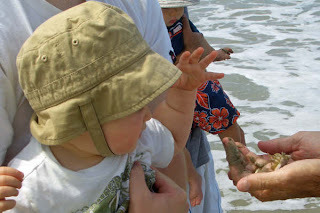 He was unsure about going in the cold water but he loved the sand...especially eating it! Here are just a few of the pictures we took! Grandpa dug a huge hole for the boys to stand in! It was too cute. 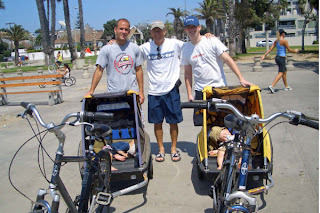 Ralph, Greg, and Ryan took the babies on a bike ride while us girls got to lay out! Both boys fell asleep but Maddux was so asleep he tipped over and had his face smashed in the corner which is why you can't see it! 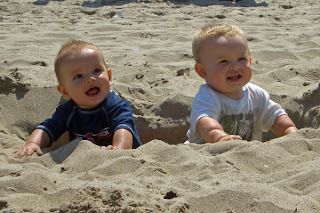 They boys favorite part was playing with water and sand in buckets! 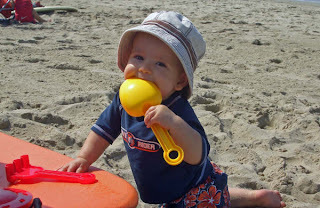 Such a cute little beach baby! I have had these pictures forever and have not had the time to sit down and post until now! We spend lots of time these days at the High School Cross Country Meets supporting "Coach Harris" and his team! His boys are doing so good this year so we are very proud!! Here are a couple of cute pictures we took when Greg's parents came to visit and went to two meets with us! Cheering on Daddy's team with Grandpa!